The month of October is officially recognized as the National Disability Employment Awareness month by the Canadian government. During this time, many Canadian groups work to highlight and promote the achievements of disabled workers all across the ten provinces of the Great White North. This year, many special programs are being introduced with a specific emphasis on helping Canadians with visual impairments. For instance, the Canadian National Institute for the Blind (CNIB) just released their EmployAbility Internet portal this month. Both employers and employees can find a wealth of information and resources for hiring people with vision disabilities on this website. People can also watch many of the promotional videos the CNIB has produced online. All of these ads were intended to shatter the misconceptions that so often surround the "limitations" of visually impaired workers in Canada. People with visual impairments all across Canada are now speaking up about the difficulties they face finding a secure job in the current economy. They also are talking about the false stereotypes that often unfairly restrict them from entering into the Canadian workforce. One false stereotype many employers believe is that blind or partially blind employees will always need someone to help them around the office. This is not the case. 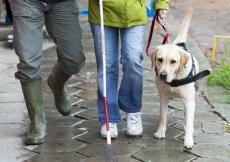 Many people with visual problems can get around the office just fine with either a cane or a seeing-eye dog. Also, many employers think that they will have to make a lot of accommodations for a partially blind employee, especially when it comes to reading transcripts or computers. Most employers seem to forget that most people with visual disabilities can read Braille fluently. As long as there are compatible Braille transcripts or portable units, there will be no problems. The CNIB hopes that their ad campaign will make Canadian employers think twice before turning down a visually impaired applicant. The staff at the CNIB wants everyone to know that blind and partially blind citizens can make exceptional employees in a wide range of industries, and these employees will never negatively impact a company's budget due to their disability.